Cold Smoked Cheese is a very simple technique with very rewarding results. Follow our instruction and enjoy some all natural smoked cheese. The cooler season is here and that’s the perfect time to think about cold smoking techniques that bring special flavoring to heat sensitive items. First up for us, cheese! We’re lighting up the Technique Cast Iron Stove Top Smoking Pan and loading it up with our favorite varieties of cheese in preparation for a couple of recipes. If you don’t own a stove top smoker pan, see our blog titled “The Kitchen Find” which will guide you on using items likely found in your own kitchen. Cold smoking requires that you keep the temperature below 90°F. That may sound like a challenge but when you use a stove top smoker – equip it with an ice cube pan – you’re on your way to all things cold smoked. 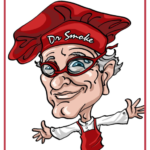 The best chips to use for this method of smoking are SmokinLicious® Minuto® Wood Chips. I’m electing to use Wild Cherry for the balance of flavors between my cheese choices. These chips will combust evenly and slowly, releasing a steady smoke vapor that will work well with the cheese. Be sure you have a handful of wood chips in the base pan before adding the drip pan full of ice cubes. Place the wood chips in the center of the pan then fill the drip pan completely with ice. Then add the grill pan and get the cheese out of the refrigerator. Remember, you will be smoking the cheese for a few hours so you’ll need to refill the drip pan with ice cubes every hour. There is no need to replenish the wood chips as a single handful will be plenty. 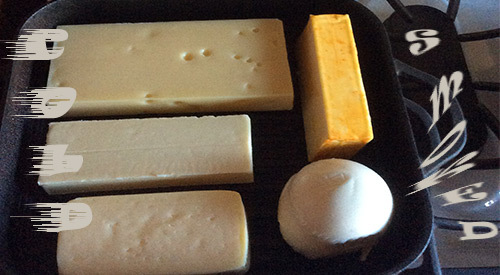 With the heat set to the lowest setting possible on your stove top, the drip pan filled with ice cubes to reduce the temperature even more, the cheese selections which include Swiss, horseradish cheddar, muenster, and fresh mozzarella, are added to the grill pan. Place the cover on and this should be left untouched for at least an hour. Once the hour passes, it will be time to replace the ice cubes in the drip pan. Be sure to leave the cover on the grill pan when changing out the ice tray. This should be done every hour up to the final hour you want to smoke. I am doing a four-hour process on my cheese today so I will replace the ice pan three times. That’s it! Once infused, remove the cheese, wrap in wax or parchment paper and refrigerator for at least 2 days to allow the smoke vapor to release throughout the cold smoked cheese process. Then get ready to enjoy your smoked cheese as is, or include in recipes. We have 2 recipes coming up: A smoked cheese and bacon quiche and smoked grilled cheese with tomato and pepper jelly. I hope I’ve inspired you to try cold smoked cheese on the stove top. We need your comment and rating, so subscribe and follow us so you don’t miss a thing. As always we welcome your suggestions as well on recipes and techniques you want to learn about. We are your source for all things wood-fired, providing tips, techniques, recipes, and the science behind the fire.